Rapid growth in the American senior population is creating new demand for specialists in geriatric medicine. The one-year Geriatric Medicine Fellowship at Hennepin Healthcare prepares internists and family physicians to be leaders and experts in clinical practice with the elderly. Our fellowship was founded in 1999. It is ACGME-accredited and received accreditation "with commendation" in our most recent evaluation. As the only Geriatric Medicine Fellowship in the Twin Cities, our program provides a sound didactic and clinical education with broad experiences in caring for elderly patients in a variety of settings. Fellows learn the theoretical and practical aspects of senior care, enabling them to serve as consultants to other physicians and to excel in their own clinical practice. Our fellows and faculty share a passion and commitment to our elderly population. Our physicians work in a collaborative, multidisciplinary environment. As an academic healthcare system, Hennepin Healthcare maintains a long tradition of cooperative teamwork that leads to great patient care. The Geriatric Medicine Fellowship provides ample opportunity for hands-on training, teaching residents and medical students, and developing a well-rounded framework for geriatric care. A highlight of our curriculum is our partnership with Hennepin County Adult Protective Services. Fellows serve as medical consultants to county caseworkers as they investigate individuals reported to the Adult Protection program as potential victims of abuse, neglect, or financial exploitation. During home visits to Adult Protective Services clients, fellows identify the urgency of the individual’s medical situation and the individual’s capacity for medical decision-making. With other professionals, they devise creative and collaborative avenues for care. Fellows work across the county as part of a multidisciplinary team in geriatric medicine, adult protection, and law enforcement. Hennepin Healthcare offers numerous didactic experiences in Geriatric Medicine. In addition to these scholarly activities, we encourage fellows to develop a project for presentation at a national or regional scientific meeting, or for publication. We provide full financial support to attend the annual meeting of the American Geriatrics Society. Topics include epidemiology of dementia and delirium; educational and clinical outcomes of consultative initiatives in adult protective services for vulnerable adults; palliative care clinical outcomes; diabetic management in long-term care settings; and more. Fellows have additional didactic sessions in research study design, statistical analysis, and critical review of medical literature. A shared commitment to exceptional senior care unites our faculty—and our fellows. Our large and collaborative staff take a hands-on approach to teaching. All core faculty hold positions at Hennepin Healthcare and the University of Minnesota. The Geriatric Medicine faculty have served as national and international leaders in academic and specialty organizations. Dr. Kerzner is past president of the Association of Specialty Professors and former International Accreditation Site Visitor for geriatric medicine fellowship programs. John C. Stendahl, MD PhD; Brooke M. Heubner, MS; David E. Tupper, PhD; Lauren McPherson; Kate Miley; Anne M. Murray, MD MS. Cognitive impairment in chronic kidney disease. Preliminary results of the BRINK study. Alzheimer’s Association International Conference, July 2013, Boston, Massachusetts. Murray, AM. Vitamin D: an intervention for cognitive impairment in hemodialysis patients that could make sense. Clin J Am Soc Nephrol. 2013 Jun; 8(6): 896-7. Kerzner, LJ. Approach to Dementia—2012. Minnesota American College of Physicians annual meeting, Minneapolis, Minnesota, November 2, 2012. Kerzner, LJ. Update in geriatric medicine education. MMDA Topics in Geriatric Medicine and Medical Direction. 2011; 32(6): 1-6. Kerzner, LJ. Cognitive impairment; focus on executive dysfunction. Hennepin County Vulnerable Adult Law Enforcement Team, Minneapolis, Minnesota, August 16, 2011. Murray, AM. Exploring mysteries of dementia: researchers study links to kidney disease, diabetes, cardiovascular health. Minnesota Physician. December 15, 2010. Holley, AP Gorawara-Bhat R, Dale W, Hemmerich J, Cox-Hayley D. Palliative Access Through Care at Home: experiences with an urban, geriatric home palliative care program. J Am Geriatr Soc. 2009 Oct; 57(10): 1925-31. Holley A, Kravet SJ, Cordts G. Documentation of Code Status and Discussions of Goals of Care in Critically Ill Hospitalized Patients. J Crit Care. 2009 June; 24(2): 288-92. Buen, C, McCusker, ML. Complex decision-making in a patient with sickle cell diseases. Approaches in Critical Care 2009: 3:2-5. Meyers, RM, Reger L. Diabetes management in long-term care facilities: a practical guide. J Am Med Dir Assoc. 2009; 10(8): 589. Geriatric Medicine fellows follow an assigned panel of patients longitudinally throughout the year and provide consultation services to in-patient physicians when their primary care patients are hospitalized. We offer focused rotations in dementia evaluation, geriatric psychiatry, inpatient geriatric consultation, palliative care, Parkinson’s disease and movement disorders, rehabilitation medicine, stroke, urogynecology, and bone metabolism clinics. Fellows rotate in geriatric psychiatry and dementia evaluation at the Minneapolis Veterans Administration Medical Center. The VA Medical Center is a teaching hospital that provides a full range of patient care services with state-of-the-art technology, as well as education and research. Fellows rotate in Parkinson’s disease and movement disorders at Park Nicollet Struthers Parkinson’s Center. The National Parkinson Foundation designated the Struthers facility as a center of excellence. Its interdisciplinary, team-based approach to treatment has served as an innovative model for care since 1978. Commitment to exceptional senior care. Our faculty and our fellows share a passion for all aspects of geriatric medicine. Fellows learn the latest knowledge and skills in senior care in an energetic, interdisciplinary environment. Graduates find our program intensely personally rewarding. 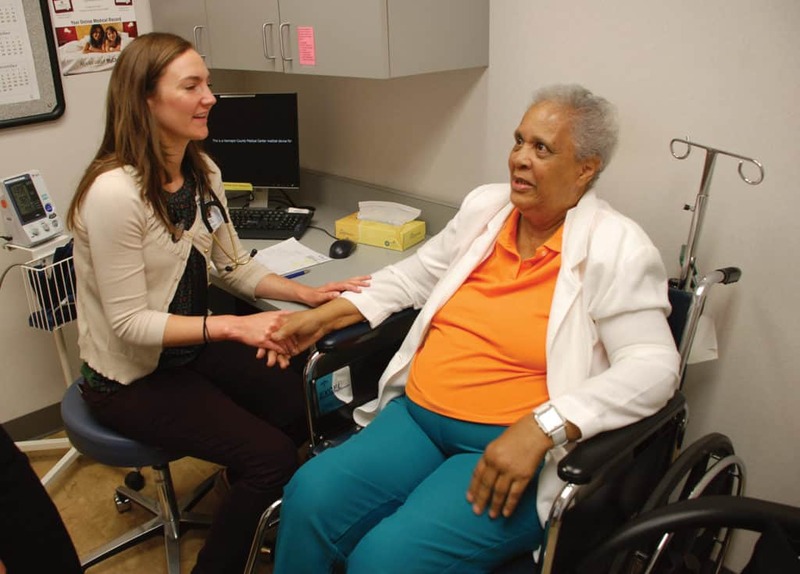 Hennepin Healthcare physicians gain valuable insights by collaborating in one of the country’s first geriatric medicine-adult protection law enforcement partnerships, designed to protect at-risk seniors. Fellows serve as medical consultants to Hennepin County caseworkers as they investigate individuals reported to the Adult Protection program as potential victims of abuse, neglect, or financial exploitation. Our program structure enables our physicians to care for the full spectrum of senior populations, including healthy elders, frail elderly, those who are cognitively impaired, and those with a terminal illness. Training includes specialized experience in Parkinson’s disease, dementia and Alzheimer’s care, end-of-life and palliative care training, biomedical ethics, and more. Geriatric Medicine fellows gain hands-on clinical experience in a range of environments, with a strong focus on outpatient care. Rotations include a nursing facility, ambulatory geriatrics clinics, and in-patient experiences, as well as community and home care settings. This well-rounded training prepares our graduates for leadership positions in senior care facilities, for clinical practice, or as teaching faculty. From day one, fellows undertake leadership roles in a variety of situations, including teaching residents and medical students, participating in Hennepin Healthcare’s Biomedical Ethics committee, providing guidance in vulnerable adult protection teams, and training to serve as geriatric medicine consultants to other physicians. Applicants must be U.S. citizens, permanent residents, or possess a valid visa. Hennepin Healthcare sponsors the J1 visa only. Submission: Submit your application through the Electronic Resident Application System (ERAS). Applicants who are currently enrolled in a Hennepin Healthcare residency or fellowship program should contact the program director for specific requirements. Interviews: Applicants who meet a score threshold will be invited for interviews. We hold interviews on a rolling basis as we receive applications. Medical Specialties Matching Program (MSMP) – Our Program participates in the Medical Specialties Matching Program. The Geriatric Medicine Fellowship is based at Hennepin Healthcare, one of the premier public teaching hospitals in the country. Our campus in Downtown Minneapolis spans five city blocks and houses in-patient and ambulatory services, our Level I Adult and Pediatric Trauma Center, numerous specialty clinics, and our ambulatory senior care clinic. As a public hospital, Hennepin Healthcare serves a multicultural patient population, including the region’s urban and underserved individuals.